Sanco also wants the North West’s premier’s lifestyle and ‘sudden wealth’ to be audited. North West traditional leaders should not be lured to form part of North West Premier Supra Mahumapelo’s push-back mobilisation strategy, the SA National Civic Organisation (Sanco) said. “They must not underestimate the anger of their subjects and find themselves caught in the crossfire,” chairperson Paul Sebegoe said on Thursday. He said traditional leaders should not be lured in the strategy based on unfounded allegations that there was a purge targeted at those who supported the campaign by Dr Nkosazana Dlamini-Zuma in the run-up to the African National Congress’ (ANC) 54th National Conference held at Nasrec in December. Mahumapelo met with traditional leaders at Sun City outside Rustenburg on Thursday, after traditional leaders requested to meet him on Wednesday, saying they wanted to be part of solutions to problems in the province. The traditional leaders also wanted to meet President Cyril Ramaphosa before he made any pronouncement on Mahumapelo, and also to meet all those who wanted Mahumapelo out. Sebegoe appealed to disgruntled communities demanding the resignation of Mahumapelo to remain calm and give the national intervention a chance. 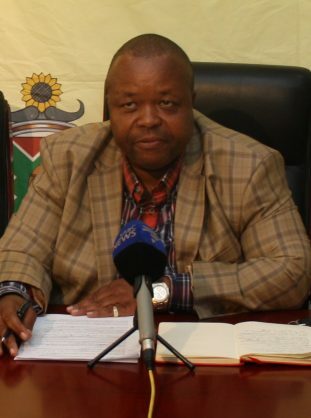 He expressed hope that allegations of multimillion-rand corruption levelled against the Mahumapelo-led administration, including his sudden accumulation of wealth, would be thoroughly probed and all attempts to manipulate investigative processes set aside. Mahumapelo, during the state of the province address, called for the first premier of North West, Popo Molefe, MECs and all key officials to help the investigators in an attempt to probe the corruption. Sebegoe is a former finance MEC in North West. Sanco also welcomed Cabinet’s decision to invoke Section 100(1)(b) of the constitution allowing national government to intervene in the provincial crisis. “President Cyril Ramaphosa has, through the intervention, demonstrated decisive leadership needed to address the near collapse of the provincial administration and service delivery challenges facing our communities,” he said.